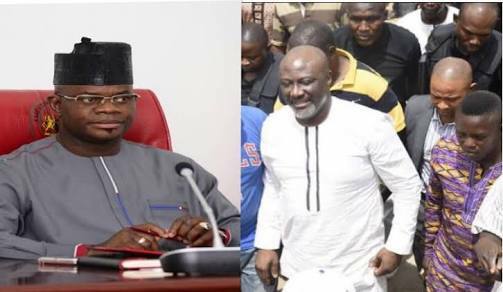 While speaking in an interview with Osasu Igbinedion on The Osasu Show, governor of Kogi state, Yahaya Bello, said that Senator Dino Melaye is inconsequential in the politics of the state. The governor who was commenting on the Wednesday incident where a block of four classrooms Melaye donated to Government Girls Secondary School, Sarki Noma, Lokoja, were burnt down by suspected hoodlums, said Dino is an “attention seeker” who may attack himself to get public sympathy. He said neither he nor his supporters played a role in the attack, adding that there is a possibility Melaye staged the incident. “The project that was embarked on by him that was burnt down is highly condemnable. I condemn it in its entirety,” Bello said. “Remember the person in question is an attention seeker, remember he has orchestrated self-attacks severally in the state and I won’t be surprised in order to draw public sympathy if he organised that for himself. “That is not our character, that is not my own style of politicking. If anything, any development is for the people. The money did not come from his pocket, it is public fund meant for the people. "So, if he tries to do that, and turn around to seek for public sympathy and orchestrated that on himself again, it is most unfortunate. That is the only way I can attribute it."